Cheryl is the managing partner of the Danvers and Methuen locations. 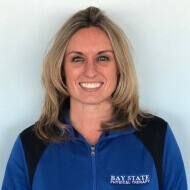 After obtaining her Master’s Degree of Science in 2003 from Northeastern, she completed a two year post graduate residency program in Norwegian manual therapy earning her an Orthopedic Manual Therapist certification specializing in the spine and orthopedics. Her studies at The Institute of Orthopedic Manual Therapy gave her an intricate understanding of the biomechanics and rehabilitation principals of the spine and extremities; this knowledge allows her to treat patients efficiently and effectively. As a former competitive swimmer with 17 years of experience, including 6 appearances at the United States National Swimming Championships, she understands the passion and drive possessed by athletes. Cheryl is committed to helping her patients restore optimal function and performance and has worked as a member of the Boston Marathon rehabilitation team. Cheryl places a strong emphasis on patient education in an effort to help people gain a thorough understanding of their injuries, promote the healing process, and avoid recurrence of symptoms in the future. She is committed to helping every one of her patient’s accomplish their personal goals and meeting their highest level of pain-free function.